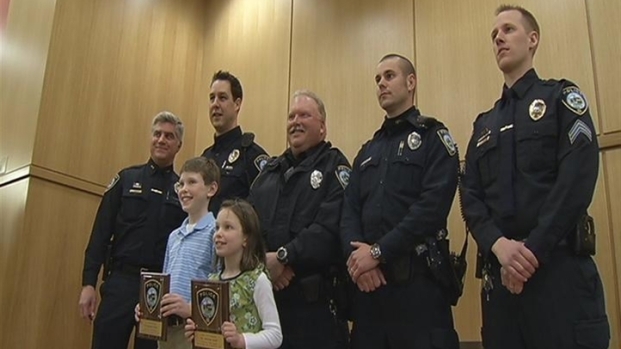 Darien police honored a 10-year-old boy and his 7-year-old sister on Thursday night for saving their babysitter's life in January. Tucker and Nina Stoops took a bow in front of a packed auditorium of friends, family and teachers at the Darien library. It all unfolded one night when babysitter Naida Maldonado suddenly had trouble breathing. Nina ran upstairs and told her older brother Tucker what was happening and Tucker immediately called 911. You can hear the call here. But, here are some of the highlights. Tucker: My babysitter is having a hard time breathing, I think. Dispatch: OK. How old are you? Tucker: I'm 10 years old. Dispatch: How old is your babysitter? Tucker: Yes and she's making a strange noise. I don't know if she's OK.
A 10-year-old boy and his 7-year-old sister call 911 are recognized for saving their babysitter's life. "I've just sort of known my whole life how to call 911. My parents taught me," Tucker said on Thursday. Darien police Sgt. Jeremiah Johnson answered Tucker's 911 call and walked him through the scary ordeal and said Tucker was incredibly calm and composed, not to mention extremely polite. "At first, I wasn't taking it as seriously as other calls, just because he was so calm. Based on what he was telling me though, I knew it was very serious, so we sent people over right away," Johnson said. Maldonado could have died had Tucker not called for help, doctors said. "They are my heroes. They are absolutely my little heroes. I wouldn't be here right now if it wasn't for them," Maldonado said. Tucker and Nina's mother, Christina, is so proud of her children and thankful that Maldonado is back to babysitting. "When I heard the call for the first time, it brought up so many emotions. You could tell from Tucker's quiver that he was nervous, but that he completely kept it together," Christina Stoops said.